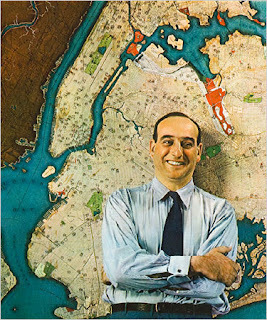 Today marks the thirtieth anniversary of the death, at age 93, of Robert Moses, probably the person with the single greatest influence on the shape of New York in the 20th century. The list is endless and these are just a fraction of the projects that came about under his stewardship. At one point, Moses simultaneously held twelve different state and city offices, from being in charge of slum clearance to running the highways to overseeing the parks. By the late 1960s, Robert Moses’ influence in New York was on the wane. His last big project in the city had been the 1964 World’s Fair in Flushing Meadows, Queens, and he had retired from most of his official positions. What ended up as his last great fight was the battle of the Lower Manhattan Expressway (sometimes called LOMEX), a road that had first been proposed in 1929 and did not ultimately go down in defeat until 1969. 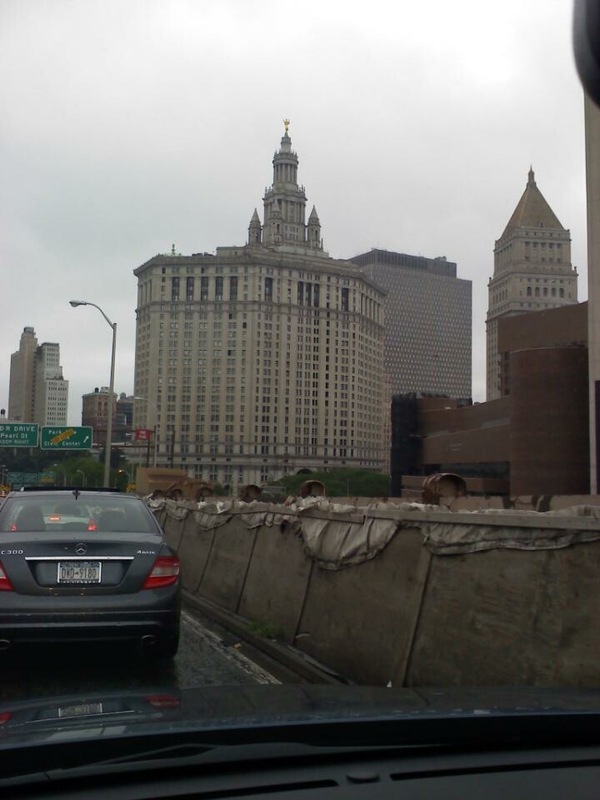 The purpose of the expressway was to relieve downtown traffic and connect the Williamsburg and Manhattan Bridges to the Holland Tunnel. By the 1940s, Moses was proposing an eight-lane elevated highway roughly following the paths of Broome and Delancey Streets across the island. To Moses and other urban planners, the area that LOMEX would traverse—not yet called “SoHo,” a moniker that would come into use in the late 1960s—was the definition of urban blight. 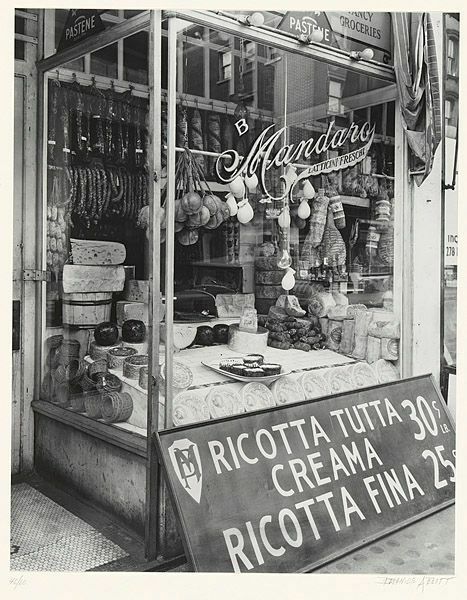 Had the expressway been built, a number of wonderful cast-iron structures would have been lost—indeed, the city was well on its way to tearing down SoHo in its entirety. Luckily, Jane Jacobs and the Joint Committee to Stop the Lower Manhattan Expressway convinced the city’s Board of Estimate not to move forward and SoHo was saved. A reader and fan of Inside the Apple sent along the above photo and asked if we could delve a little into the history of the building. It is the Municipal Building, built 1909-14 by William Kendall, a junior partner in the venerable firm of McKim, Mead, and White. It was the first foray of that firm into skyscraper building, and it had a huge impact on the form--at least in the Soviet Union. Starting in the last decades of the 19th century, the city began contemplating tearing down its 1812 City Hall, which was too small for the modern workings of government, and replace it with a grander building. They even went so far as to have a design contest, which was won by John Rochester Thomas. Meanwhile, a plan was concocted to move the old City Hall to 42nd Street and use it to house the New York Public Library. In the end, however, the American Scenic & Historic Preservation Society--one of the first preservation groups in the country--prevailed on the government to leave City Hall alone. Thomas's new City Hall was built, with modification, on Chambers Street, and became the Surrogate's Court. 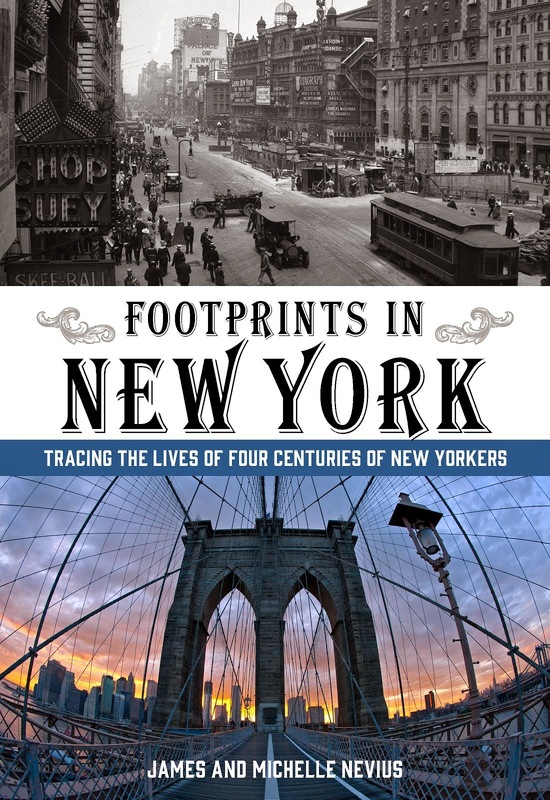 * This meant that the city was still in dire need of more office space for its workers--especially after January 1, 1898, when New York consolidated the five boroughs into one city. With consolidation, New York was, without question, America's largest city, and many felt it needed a true Civic Center to match. Only fifteen years earlier, the city had began systematically destroying the old Five Points neighborhood, which lay just north of Chambers Street, and over the first three decades of the 20th century, the building of the Civic Center allowed the city to clear the worst blocks of the Five Points. In rapid succession, the city, state, and federal governments erected the Municipal Building, Supreme Court, U.S. Court, Department of Health, and what's now called the Louis J. Lefkowitz State Office Building, in the area that only a few years earlier had been teeming with immigrant families. The architecture of the Muncipal Building reflected New York's place in the world--and Manhattan's place in New York. The top of the building is crowned by Civic Fame by Adolph Weinman--the second tallest statue in New York after the Statue of Liberty, though no one can agree how tall it is: sources list it as 20 feet, 25 feet, and 30 feet. The figure represents New York leading the way into the future, a beacon for other cities to follow. (Being famous, in this instance, meant "setting a virtuous example for future generations" and not "being Kim Kardashian.") The statue sits atop a high tower that is surrounded by four smaller towers. The big tower is Manhattan--the four other towers are the outer boroughs, surrounding Manhattan like satellites. The Municipal Building was evidently greatly admired by, of all people, Josef Stalin. 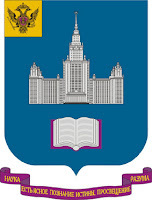 Certainly copies of it soon began popping up all over Moscow and around the Soviet bloc, from Moscow University (pictured at right, on the school's crest) to the Hotel Družba in Prague. Until 2009, many New Yorkers only knew the Municipal Building as the place to go for a civil marriage ceremony. However, that has moved to the Lefkowitz State Office Building, just a couple of blocks north, where, in just a few days, hundreds of couples will celebrate New York's marriage equality law. * Thomas's Surrogate's Court building, based on the Opera in Paris, is the subject of a blog post we're working on right now. Don't change that dial! Do you have a picture of building in New York that you want to know more about? Send it to info@insidetheapple.net and we'll see what we can dig up! 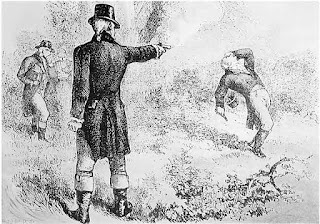 Today marks the 207th anniversary of the famous duel between then-Vice President Aaron Burr and former Treasury Secretary Alexander Hamilton. We blogged about the duel last year (and dedicated a chapter to it in Inside the Apple), but there have been a couple of new developments in the past year, most excitingly the imminent reopening of Hamilton's Harlem home, the Grange. The Grange has been closed to the public for nearly five years, going through a move and an "extreme makeover" designed to make Alexander Hamilton's "sweet project" look and feel as welcoming to us as it did to Hamilton and his family when they moved in in 1802. The house was built by John McComb, Jr., the architect responsible for Castle Clinton in Battery Park and, along with Francis Magnin, New York's City Hall. Hamilton wanted to move his family to the heights of Harlem to get them away from the hustle and bustle--and disease--of the city. However, Hamilton only got to occupy his home, originally set in a vast, 32-acre property, for less than two years before being killed by Burr. In 1899, the house was moved about four blocks from its original location in Hamilton Heights to a lot owned by St. Luke's Church near the corner of Convent Avenue and 140th Street. Over the years, the house was surrounded by a church on one side and an apartment block on the other. As early as 1962, the National Park Service began thinking about relocating the home again. That move finally took place in June 2008, when the house was jacked up off its foundations and rolled to a new site in St. Nicholas Park off 140th Street. The Grange's new location is more reminiscent of what Hamilton would have experienced when he lived in the house. The house is set to reopen on September 17. It is worth noting that the other famous colonial house in Harlem, the Morris-Jumel Mansion, was the place where Aaron Burr got remarried in 1833 (to the home's owner, Eliza Jumel) and where he lived toward the very end of his life. After he resigned from the presidency on August 8, 1974, Richard Nixon began to put the pieces of his life back together. Knowing that he would not be allowed to practice law, he resigned from the California bar, as well as the bar of the U.S. Supreme Court. However, when he attempted to resign from the New York bar, the New York Bar Association turned him down. If they were to accept his resignation, they argued, he would need to publicly acknowledge that he had obstructed justice in the Watergate affair. And since Nixon wasn't going to do that, they weren't going to just let him quietly resign. Instead, they disbarred him. On July 8, 1976, in a 4-to-1 decision, the Appellate Division of the State Supreme court (in the words of The New York Times): "sustained five charges that Mr. Nixon had obstructed 'the due administration of justice' and thus violated the Code of Professional Responsibility, a set of rules that all lawyers are required to observe." 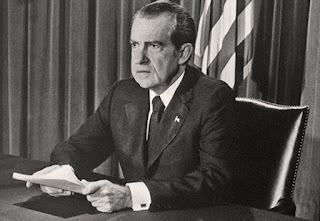 However, while this public rebuke--the only time that a court of law found Nixon guilty of anything relating to Watergate--must have stung, the former president was probably paying little attention. The previous day, his wife Pat had suffered a stroke in their swimming pool at their home in California; on July 8, she was rushed to Long Beach Memorial Hospital.The stroke left her paralyzed on her left side (though she was able, through physical therapy, to regain much of her movement). The former first lady suffered a second stroke in 1983, and died in 1993. 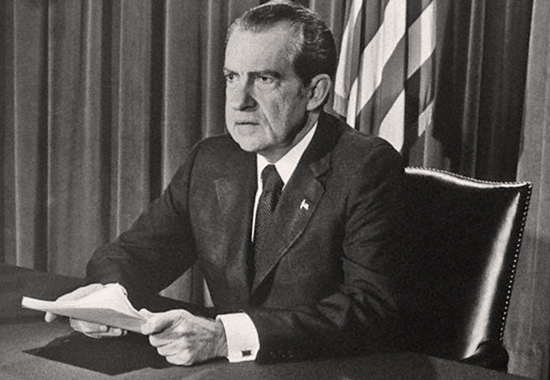 President Nixon died a year later. Nixon's disbarment wasn't the only problem he faced in New York; in 1979, he attempted to purchase a condo apartment at 817 Fifth Avenue. Rarely do condo boards turn anyone down, but in this case, the board decided to buy the vacant apartment themselves rather than let the former president move in.